Caja running at 32 percent. I’ve had this problem before and it was fixed by reinstalling the appropriate thumbnailer, but this time a reinstall didn’t fix it. I’m running the MATE desktop, and Caja is often running at 32 percent on the system monitor, despite it not even being open. To be clear, it’s not I’m running Caja, it sticks at 32 percent, and then it’s not shutting down properly… it’s I’m running it and shutting it down, the CPU loads drops to 0 percent, and then much later I can see CPU activity and when I check the monitor it’s always Caja. It’s almost like it’s running in the background despite me shutting it down, and then randomly freaking out at some later point in time. Not sure what’s going on here… any ideas? Caja handles your desktop (wallpaper and icons) so it is technically always running. Try changing your wallpaper to a different image using a different format. Perhaps it has something to do with that (though it shouldnt). Have you checked on Caja’s bug tracker for similar reports? I did have a look at the Caja bug tracker, and although there’ve been similar issues in the past, I couldn’t see anything current. Tried changing the wallpaper, but it still keeps hitting 32 percent CPU usage. @melchizedek Are you sure that %CPU is actually consumed by caja? Did you check it with top, htop, System Monitor? 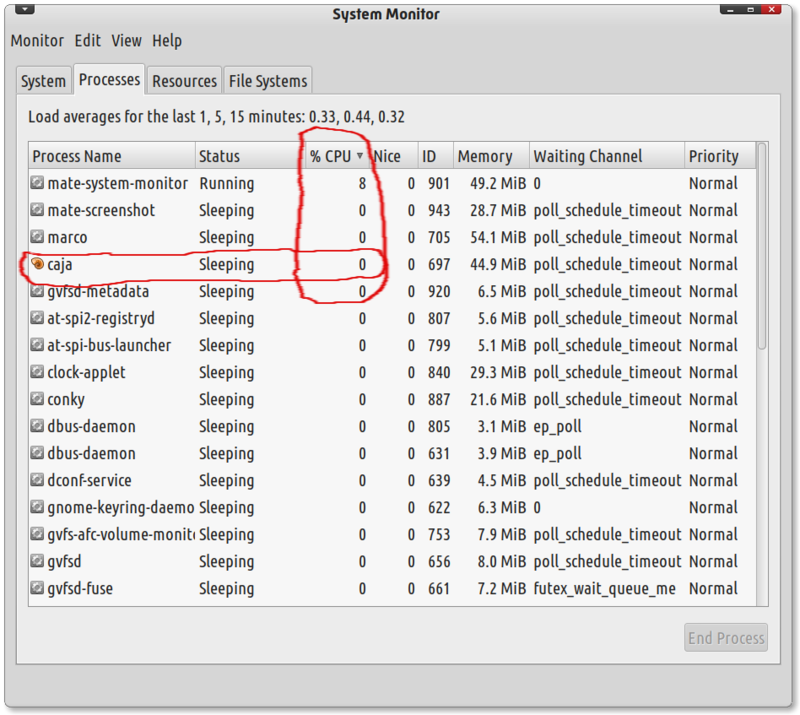 What makes you think that the high CPU usage is caused by caja? It could be another process. Caja isn’t open, yet it still registers as 48 percent–usually running on one core.